Last weekend, Grant and his girlfriend went to 5th Annual Silent Night Deaf Ministry Scholarship Benefit at Lover Lane United Methodist Church (LLUMC) in Dallas. This is his 2nd time to attend – last time, he went there and watched World First Deaf Solo Rode Sailboat around the World presentation. It was enjoyment overall along silent auction, entertainment, presentation, and wonderful dinner & dessert including brief presentation from DISD Trustee Dr. Edwin Flores. Grant won one of the bidding, he received “A VIP Wine Tasting Event for 20” event worth $750 according to certification. He never been there before and looking forward to it!! Kudo to Rev. Dr. Tom Hudspeth and his team for wonderful event again! 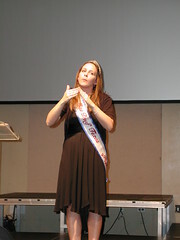 Anyway, they enjoyed the most of all is presentation from Miss Deaf Texas name Katie Murch. She gave a powerful message about her life struggle with public school in her hometown – not too long ago. Grant admitted he thought it was just this little cute show, but he didn’t know her actually delivery awe-inspiring speech. Also, she kept saying how important that parent stay activity in their deaf children during school times. It is clearly that our community has a long way to go. Katie’s dream is to establish an unbiased information network to all parents of deaf children. Yes, that would include sign language, cochlear implant, hearing aid, oral methods, etc. The Bottom line is to get best communication and education for deaf children. It does of the highest importance that parent understand what it takes to raise deaf children otherwise the children will be lost forever. If you live in Texas and want to get with Miss Deaf Texas Katie Murch for show and presentation, contact them!! Grant promised it is best investment you ever get for your local event, whether it is for deaf or hearing audiences.